It started in the early hours of Monday morning. I rolled out of bed and tiptoed to the kitchen table to stare at my laptop bleary-eyed: 3.04 am in Brussels, 10.04 am in Incheon, Korea. The world’s top climate scientists had just released one of the most important climate science reports ever: a warning that our window to avoid the worst effects of climate change is rapidly closing, but that – if governments make it a priority – we can still protect the environment and save millions of people. Within minutes, my WhatsApp and Skype chats were on fire. Scientists had effectively just given governments a kick in the arse. 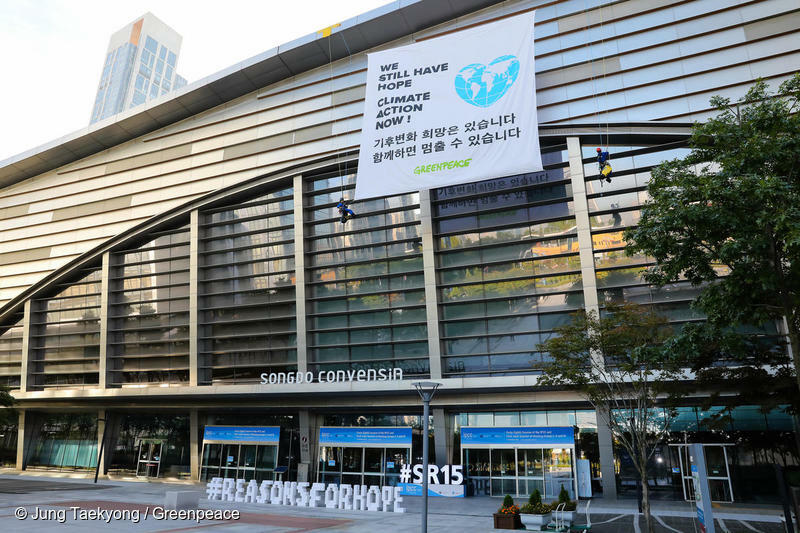 Activists unfurl a message of hope on climate change, as the IPCC releases its special report on 1.5°C of global warming in Incheon, Korea. 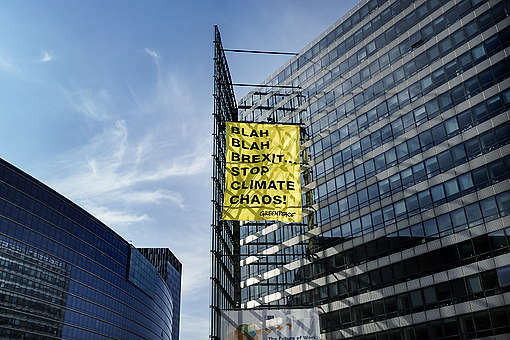 By the time I made it into the office several hours later, the report by the United Nations’ Intergovernmental Panel on Climate Change had well and truly ‘hit’ Europe. In a year when millions of Europeans have suffered tragic forest fires, deadly heatwaves and devastating drought, the inadequacy of European Union pledges on climate change were clear for all to see. Politicians right, left and centre were falling over themselves to stress the importance of the report. Few of them drew the logical conclusion that they needed to up their game – at least initially. Along came Tuesday, when environment ministers gathered in Luxembourg to plan for a global climate conference in Katowice, Poland, in early December. Unsurprisingly, there was no consensus, but in a sign that things are beginning to shift politically, 15 countries did speak up. They supported ramping up EU climate targets in line with the Paris climate agreement and Monday’s IPCC recommendations. Germany’s minister Svenja Schulze was surprisingly vocal, given Angela Merkel’s earlier reluctance to bring the targets in line with the science. If anyone ever doubted it, it’s now clear that Germany has become a major battleground for Europe’s response to climate change. Demonstration to protect the Hambach forest in western Germany from the expansion of a lignite mine owned by power utility RWE. Demonstrators called for a speedy phase out of coal in Germany. 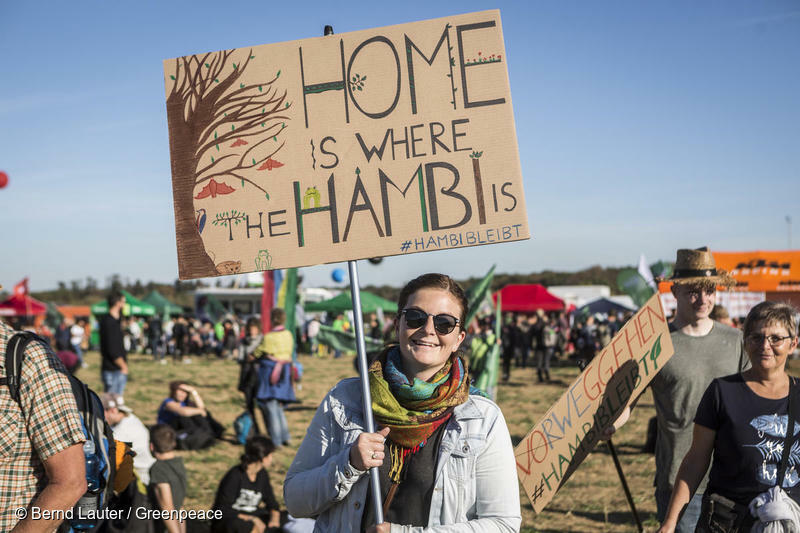 A powerful movement has grown out of protests to stop the destruction of what’s left of the ancient Hambach forest in Western Germany, to make way for Europe’s biggest lignite mine. But as Germany contemplates a country-wide coal phase-out, the alliance between dinosaur industries and politicians is not dead yet. 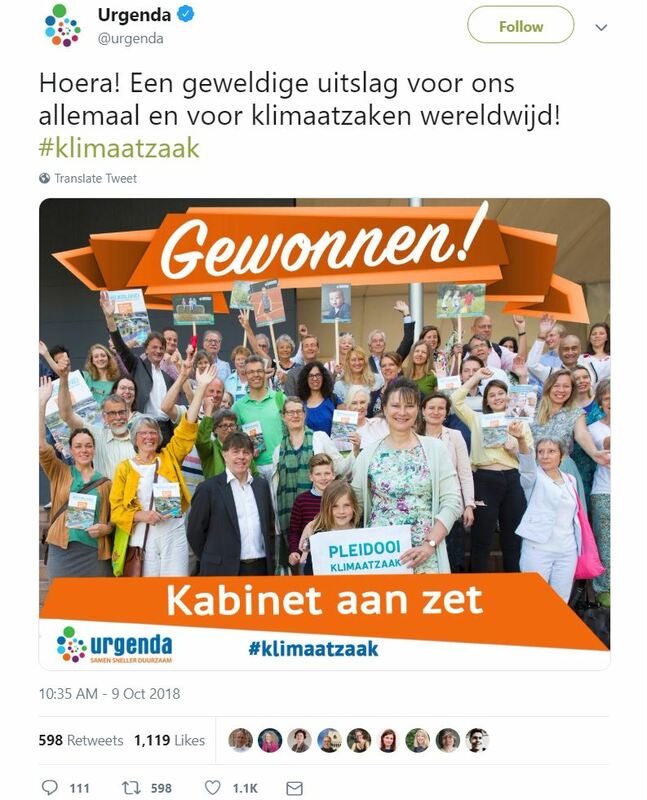 Only hours after supporting greater European climate ambition – and seemingly oblivious to the irony – Schulze fought tooth and nail to water down measures to limit CO2 from cars. 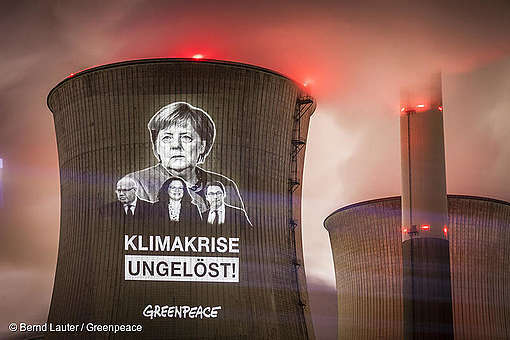 The German government’s attitude to coal companies and carmakers only shows that politicians have lost touch with the zeitgeist on climate change. 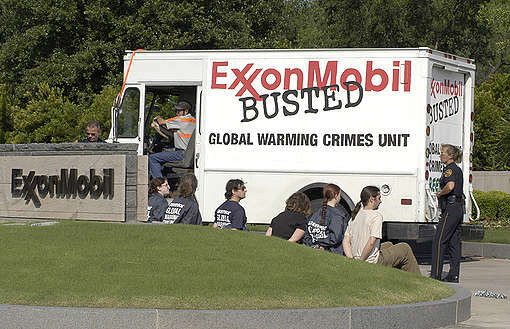 Now, after getting a beating from scientists, the courts are also pitching in. Just this week, court rulings forced Berlin to introduce a ban on diesel cars in 11 of the city’s busiest streets, while a Belgian court told the region of Flanders it must submit a plan to deal with the worsening air pollution problem. But the stand-out legal case was in the Netherlands on Tuesday, when Urgenda, a Dutch environmental group, and hundreds of private citizens, won a landmark ruling against the Dutch government. A court in The Hague upheld an earlier decision forcing the government to fulfil its obligations on climate change. To comply with the court order, the Dutch government must shut down all remaining coal fired power stations before 2020. Truly a momentous decision in what had already become a momentous week. By the middle of the week, my neglected inbox was growing increasingly out of control. But it turned out that the week that keeps on giving wasn’t quite done. Some more great news from The Netherlands: one of the country’s biggest investors, NN Group, announced it would no longer finance controversial tar sands oil and pipeline companies in Canada and the United States, citing the projects’ carbon emissions as a major reason for its decision. 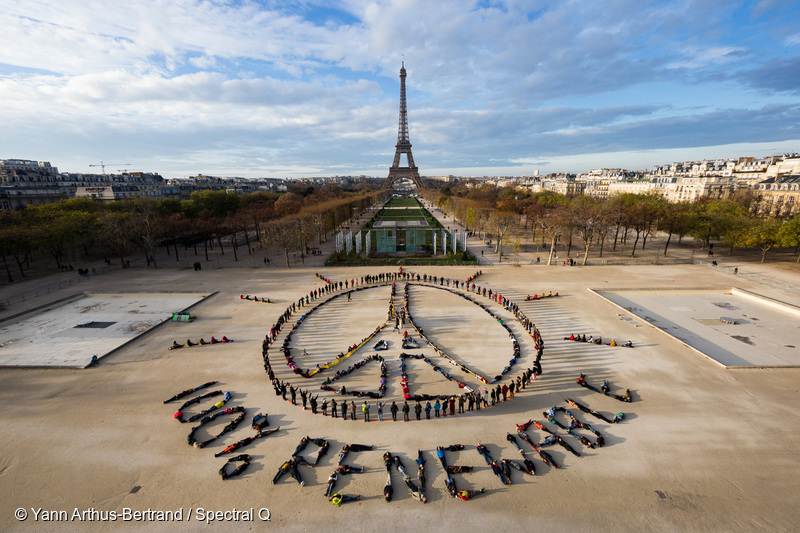 A large-scale visual message made by hundreds of people calling for a switch to renewable energy and peace during the 2015 Paris climate conference. The event was created in collaboration with international artist John Quigley. And then it was a bit like finishing a bag of M&M’s at the movies, only to find one more at the bottom of the packet. In this case, the European Parliament delivered the final treat. Members of the environment committee adopted a resolution calling on the EU to bump up its greenhouse gas emission reduction pledge and back a pathway to achieve net-zero emissions in Europe by 2050 at the latest. This would mean ending coal and all fossil fuels, radically increasing energy efficiency and ultimately powering everything with renewable energy. We would also have to change the way we produce our food, eat less meat and protect and restore our forests and peatlands. This last piece of news from the Parliament is in fact the opening salvo in what promises to be the next European political battle on the climate front. In just over six weeks, the European Commission will release a draft long-term (2050) climate strategy for the EU, only a few days ahead of the UN climate talks in Poland. So lots more to come, but for now, it’s mid-October in Brussels and I’ve had to draw the curtains on an unusually hot autumn day… There’s plenty of work to do. But what a week that was!